Acrylic, latex, & tempera on canvas. 42 in X 36 in. This has been in the works for some time. I actually spent quite a bit longer on this than I do on many of my paintings. This is in part due to the size of the piece, but also because I approached it a little differently. Akogare was one of the first anime inspired pieces I ever did. 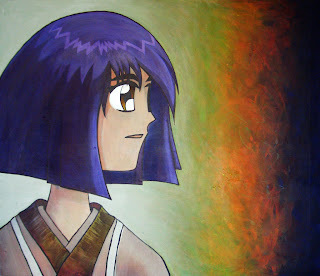 In fact, I think it was the second actual anime painting, done back in 2004. That was a long time ago. The initial version of this was an attempt to design an original character, since my first painting was based on Lain. The character itself was not bad, but the execution of it in this painting was not so very good. I still hand the painting sitting around since that day, and a few months ago was stricken by the urge to make this right. To be fair, some elements in this piece weren't bad, and there is a spontaneity to the background which does not come easily anymore. I first sketched out the character concept anew and more accurately, after which I began to paint over the original face. Nevertheless, my goal was to keep the same expression and feeling that was intended when I painted it the first time around. I took my time with the renewal of Akogare in order to make sure that I did the piece justice. Because, even though I wasn't that fond of the end result, the feelings contained in the piece were and are still important to me. With the character finished, I had a hard time figuring out what to do with the background. I knew I wanted to keep some of that powerful brushwork, but needed to tie it in with the new character somehow. After much deliberation, I decided to simply accentuate what was already there, and relate the background to the character using color. In the end, I believe I'm mostly satisfied with the result. It is certainly much stronger than the previous version, and thus Akogare is born anew. Better, faster, stronger, as release candidate 2. Or something like that.